Aloe vera’s natural goodness lies in its healing powers. Because of its wonderful medicinal properties aloe vera is today being extensively used in herbal medicines. Use of aloe vera is beneficial for the patients afflicted with arthritis, colitis, sinusitis, psoriasis and other incurable skin diseases. Aloe vera is , therefore, invaluable for the preservation of human life. Aloe vera effectively cleanses the stomach and balances & enhances proper immune system by eliminating free radicals. It is an appetizer and simulates digestion process. Latest research has revealed the presence of acimenon in its chemical composition; it multiplies the T lymphocyte cells, which strengthen the immune system. Aloe vera is known of its therapeutic value against radiation and chemical burns. All of us know that, barring accidents, all disease in our body is caused by the excessive accumulation of morbid waste (pathogenic matter). The obstruction caused by pathogenic matter in the tissues of the body interferes with nutrition and drainage of cells, as a result, the otherwise healthy cells lose vitality, deteriorate and putrefy, calling for prompt medication to subdue the germs by the use of drugs, anti-toxins and vaccines. That is what we call the combating method-fighting disease with disease, poison with poison and germs with germs. 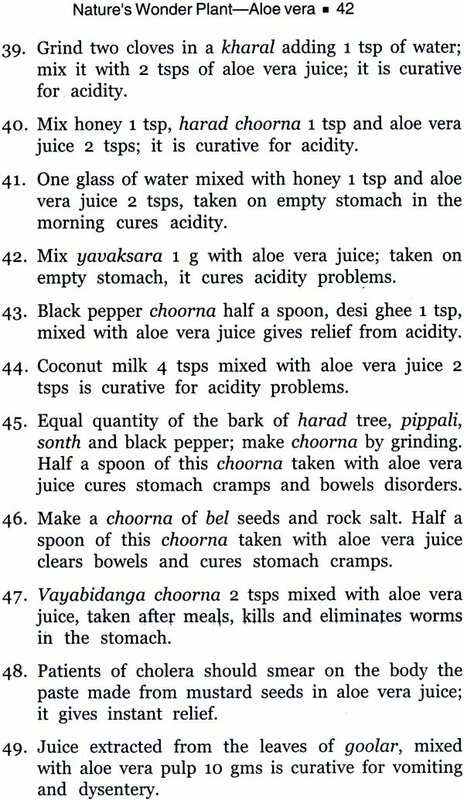 Nature cure, on the other hand is a preventive method. Prevention, so goes the old adage, is better than cure (and less troublesome too). Maintaining vital force can ward off diseases. It is the vital force which sustains LIFE, being the bulwark against disease and decay. Nature cure does not fill human bodies with drug poisons and has no side effects. The ever increasing number of adherents to natural way of living and treating human ailments by recourse to natural or organic products provides a strong evidence of the efficacy of nature cure. It is possible to acquire immunity to disease by careful observance of Nature’s laws, right living and following the natural regime. Thanks to the pioneering works of the masters of nature cure, the interest in the efficacy of the therapeutic value of Aloe vera has touched a new high. This book is a commendable effort by the authors, who are renowned Naturopaths; and it is our most humble endeavour to further spread the knowledge on the healing property of herbs in general and of Aloe vera in particular. 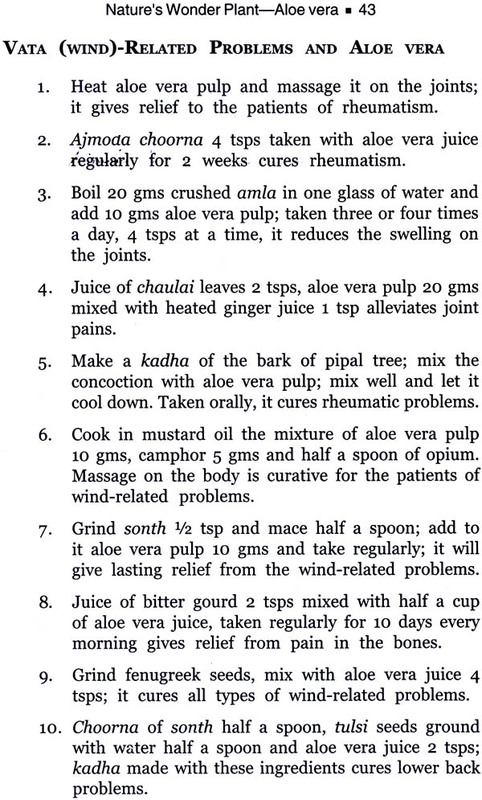 This booklet on Aloe vera is the result of joint effort by the co-authors-Dr.Ganesh Narain Chauhan and Dr. Piyush Trivedi- both of them have a long practical experience in the treatment of various ailments and diseases. Dr. Gansesh Narain Chauhan retired from Rajasthan University as Senior Professor of Homeopathy. He is a highly experienced practicing physician and enjoys the reputation of being an expert naturopath and homeopath, and he is a prolific writer having to his credit a number of books on Naturopathy. His well-researched articles on nature cure, health, nutrition, herbs and home remedies appear regularly in various newspapers and journals. His writings bear the stamp of authority. Dr. Piyush Trivedi is a highly decorated Naturopath and is one of the most renowned practicing physicians. Recently he has been awarded with very prestigious award of Acu. Shiromani, by international delegates of Sri Lanka. He is a senior consultant and adviser on various therapies-Ayurvedic, acupressure, magnetic and other alternative therapies. He has to his credit various publications on alternative medicines and therapies. Articles written by him are published in various publications on alternative medicines and therapies. Articles written by him are published in various national newspapers and periodicals-Rajasthan Patrika, Jansatta, Punjab Kesari, Dainik Bhaskar, Dainik Navajyoti, Mahaka Bharat, Rastradoot, Rastriya Sahara, Health Times, Health View, Times of India, Grihashobha, Grihalakshmi, Manorama, Acupressure Samachar, Saras Salil, Dainik Jagaran, Gulabi Jagat Samachar, Ayurveda Vikas (Dabur), Dhanvantri (The monthly periodical), Shivira, News Today, Jaina Path Pradarshak (Todarmal Smarak), etc. He is presently the Editor of Health Times (Alternative Therapy) and Acupressure-Saar.